Two weeks ago, we released GIMP 2.10.0-RC1! This is our first release candidate before the stable release GIMP 2.10.0. Yes, you heard it well, the release you have been waiting for, for 6 years, is just around the corner! What has ZeMarmot done exactly? This was a very exciting release, and for the first time, I was even the major contributor, with 270 commits out of 784 (in-between 2.9.8 and 2.10-RC1, so counting the last 4 months). This is more than the third of all changes between GIMP 2.9.8 and 2.10.0 RC1. As for other participants in ZeMarmot project, Aryeom herself designed 2 missing icons, when she wanting to have a change of mind from animating marmots, frame after frame, and Lionel (one of the board member of the LILA association heading the project) worked on improving ruler subdivision for inches. Improve debugging with a dialog gathering data and backtraces. We already discussed about it. To be accurate, it is not a 100% safeguard. By nature, a crash is a state where a process is very unstable. Hence we try what we can, and sometimes I’m sure the auto-save will fail. But in my tests, it succeeded most of the time. And that’s what matters when it will save your work! Color-managing the color picker on macOS. Screenshot with the generic Freedesktop API has been implemented. It is meant to replace all Linux desktop environment’s specific APIs eventually but needs to get reasonable features first. Therefore currently GNOME/KDE and X11 implementations still have priority. New preferences settings for metadata export, and making so that all export plug-ins respect these settings (among other things, thanks to the creation of new API for plug-in developers: gimp_export_exif(), gimp_export_xmp() and gimp_export_iptc()). This is a topic many may not care about, though it can also be a major feature to others since metadata can contain sensitive information and we know there are some people who prefer for their image editor to just never export metadata. procedures. If for instance, a second-level plug-in is interrupted interactively, we don’t want to process this as an error but as a cancellation. gimp_stack_trace_available(), gimp_stack_trace_print() and gimp_stack_trace_query() for debugging plug-ins as well. gimp_context_get_distance_metric() and gimp_context_set_distance_metric() for distance metric used in gimp_edit_blend() (and future usage). Improving gimp_edit_blend() API to use “gegl:distance-transform” operation, making it much faster. Improve splash image down-scaling so that it appears at reasonable size on a wide range of screens. Some vulnerabilities were reported in end of 2017, so I fixed CVE-2017-17784, CVE-2017-17786, CVE-2017-17787 and CVE-2017-17789. In the middle of this all, I already announced the new package mypaint-brushes. In other cool news, a student, Darshan Kadu, approached us with a FSF internship, and continued one of the existing port, for JPEG2000 format support (finishing the port of our implementation from Jasper to OpenJPEG, since the former is getting deprecated everywhere), and I am the internship mentor. This is not the first time I worked with university students since I gave a few courses in a university in Paris last year, and I must say I like the interaction (whether with a single intern or with a whole class). Now I had a few exchanges about possible future projects for interns in GIMP, possibly in GSoC (for memory, GIMP project used to do a few GSoC but stopped a few years ago; I believe the last GSoC internship happened just when I came in the project myself so I never had the chance to mentor someone in GSoC). So as I saw people proposing for interns to do all sort of major implementations in the core of GIMP, I’d like to comment on this. Personally I am mostly interested in mentoring because I like accompanying students when they discover real development world. If we can get a few cool patches in the process, this is cool. But this event should not be considered as a cheap way to get code. Any project which relies mostly on this to improve will mostly get hardly maintainable code, which took a lot of your time as a mentor but may never end up merged in your master tree. So yeah, GSoC or any internship is very cool because we can work with some bright minds of the future of software. But these are not and should never be a magical way to get cheap, fast and good code. If anyone really believe this, something is wrong! Release Candidate, uh? Stable release soon then? Yep we are definitely working as hard as we can to get the stable release as soon as possible. We even just got under the 2-digit of blocker bugs the other day (though we are now back at 10 blockers)! Actually we had to discuss a bit before naming it a RC. Indeed we believe that this is not really Release Candidate material. Well… not if we wanted to be really thorough. 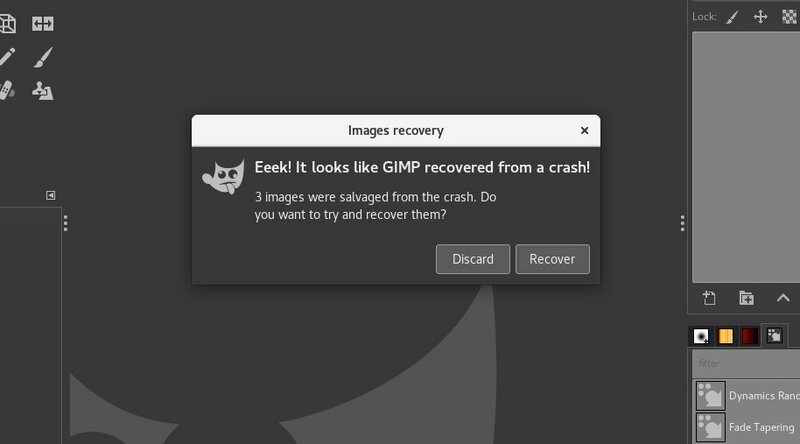 But in the same time, we are a bit tired of dragging the developement of GIMP 2.10 (for 6 long years now!). And making it a RC was our way of pushing a bit the development and ourselves, like a step in the right direction. Now you should really expect the stable release soon, unless we discover something really bad (knock on wood!) in the meantime.